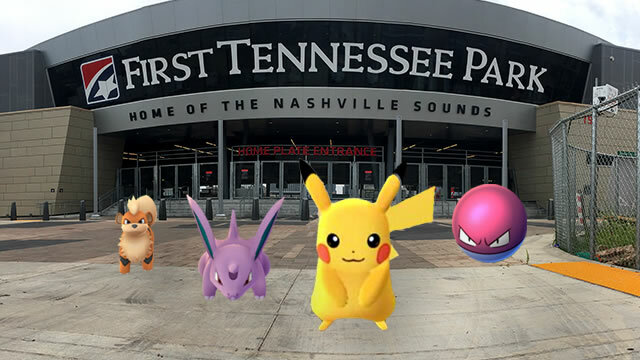 The Nashville Sounds regularly scheduled 7:05 p.m. game tonight against the Omaha Storm Chasers has been delayed due to travel issues and Pokémon invading First Tennessee Park. "Unfortunately some travel problems around the country affected the Pacific Coast League, including our Sounds, who were stuck in Phoenix overnight," said Sounds General Manager Adam Nuse. "We're going to make the best of the situation and let our fans enjoy the amenities at First Tennessee Park until both teams are ready to play. What better way than to capture the craze of Pokémon Go in the City of Nashville?" As gates open at 6:00, the Sounds will activate lures at First Tennessee Park every 30 minutes until the third inning of the game. Any fan with a ticket to tonight's game is welcome to enter the ballpark and catch as many Pokémon as they can in permitted areas. First Tennessee Park is an official PokéStop with a Pokémon Gym located near the iconic guitar scoreboard in right-center field. Bucket Ruckus, also known as Baseball's Rock Stars, will be at First Tennessee Park to entertain fans when the gates open. Due to tonight's delayed start time, the FOX 17 post-game fireworks show presented by Koorsen Fire & Security will be postponed until Monday, August 29 after the Sounds take on the Iowa Cubs. The Sounds will release more information on a specific first pitch time when it becomes available. The 2016 season is the Sounds' 19th year in the Pacific Coast League and their second as the Oakland Athletics' top affiliate. Tickets are available now by calling (615) 690-4487 or by visiting www.nashvillesounds.com.